Established in 2005 by a group of experienced disputes specialists, including a breakaway faction from Sergio Bermudes Advogados, Brazilian boutique Ferro Castro Neves Daltro & Gomide Advogados is held in high regard by prominent international firms, many of whom it has partnered with on recent cases. Today it has 50 lawyers spread across its offices in Rio de Janeiro and São Paulo, most of whom devote their time to arbitration, with many of the partners also acting as arbitrators. The best known is Marcelo Roberto Ferro, a former member of the LCIA Court and ex-vice chair of the ICC commission on arbitration and ADR who currently chairs ICC Brazil´s Arbitration and Mediation Committee. Another member of the practice, Jose Roberto de Castro Neves, was part of the commission that drafted the most recent reforms to Brazil’s arbitration law. GAR 100’s sister directory Latin Lawyer 250 says the firm’s lawyers “have established themselves within Brazil’s litigation and arbitration circles at the very highest levels”. Brazilian billionaire Abílio Diniz and businessman Nelson Tanure (see below) are known to have used the firm. It’s acted for renewables company Energia Sustentável do Brasil in a pair of LCIA arbitrations against a Brazilian insurer. One of the firm’s highest-profile cases to date was acting for Abílio Diniz, chairman of supermarket chain Grupo Pão de Açúcar (GPA), in a long-running, complex and ugly dispute against France’s Casino, which is a shareholder in GPA. Counsel managed to negotiate a favourable settlement in 2013, just two days before the arbitration hearing. The firm partnered with Debevoise & Plimpton on the case. The firm represented companies owned by Nelson Tanure in a US$150 million ICC claim against TIM, a Brazilian mobile operator owned by Telecom Italia, which he accused of fraud in connection with a merger deal. A tribunal threw out all Tanure’s claims in June 2016 but also dismissed a US$140 million counterclaim against him. In another case for Tanure, the firm helped his company Sequip defeat a claim by his former business partner Paulo Marinho worth 305 million reais. Ferro Castro Neves Daltro & Gomide also acted for the Via Amarela consortium in an ICC arbitration against São Paulo’s state-owned underground rail operator, Metrô, ending in an award of US$180 million for the client plus legal fees. The practice also gained a good outcome for seven clients in an ICC dispute worth US$100 million, by excluding them from the proceedings at the jurisdiction stage. The firm is working alongside Stoche Forbes on behalf of a Brazilian subsidiary of Dutch-registered Paper Excellence, which launched an ICC arbitration against agribusiness group J&F Investimentos in September 2018. The claim concerns J&F’s termination of a deal to sell Paper Excellence a 50.6% share in Brazilian pulpmaker Eldorado Brasil Celulose. Ferro Castro Neves Daltro & Gomide is also working alongside local firms Mattos Filho Veiga Filho Marrey Jr and Quiroga Advogados in a dispute with Brazilian milk cooperative CCPR and dairy exporter Itambé at the Centre for Arbitration and Mediation at the Brazil-Canada Chamber of Commerce. Brazilian computer programmer Tecnologia em Sistemas de Legislação turned to the firm to defend it in ICC proceedings launched by a party to a software contract with the company, in which some claims have already been dismissed. It is also acting for offshore transport company Hornbeck in a US$4 million claim against a Brazilian maritime company at the Chamber FGV of Mediation & Arbitration in Brazil. Ferro, Castro Neves, Daltro & Gomide Advogados (FCDG) is a law firm established in 2005, by a group of renowned and highly experienced professionals who shared the aspiration of offering to their clients superior law services. FCDG has reported a remarkable growth of activity in arbitration, upholding an outstanding position in the market, especially regarding commercial arbitration and construction, as well as arbitration-related court matters. 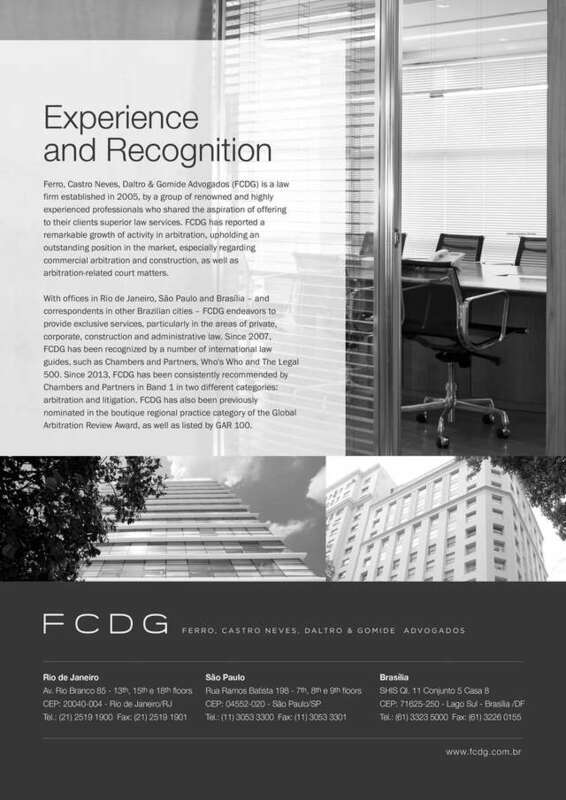 Since 2007, FCDG has been recognized by a number of international law guides, such as Chambers and Partners, Who’s Who and The Legal 500. Since 2013, FCDG has been consistently recommended by Chambers and Partners in Band 1 in two different categories: arbitration and litigation. FCDG has also been previously nominated in the boutique regional practice category of the Global Arbitration Review Award, as well as listed by GAR 100. The firm has represented clients before foreign institutions (International Chamber of Commerce – ICC, The London Court of International Arbitration – LCIA, American Arbitration Association – AAA, Court of Arbitration of Sport – CAS) and national ones (Brazil-Canada Chamber of Commerce – CCBC, Brazilian Mediation and Arbitration Center – CBMA, FGV Conciliation and Arbitration Chamber, São Paulo Mediation and Arbitration Chamber (FIESP). FCDG partners also act as arbitrators in domestic and international arbitration proceedings before the main Arbitration Institutions. FCDG partners and associates are usually recommended as future leaders in the area of arbitration and regularly publish in specialized publications.